Only Here for the Food » Blog Archive » Tailor-Made Pizzas: Urbano Pizza Co. Although there is no question downtown Edmonton is blessed with its share of top-notch restaurants, there is definitely still room for more independent quick-serve options. That’s one of the reasons why I was happy to hear that Urbano Pizza Co. was moving into the neighbourhood, offering up another fast, casual alternative. Urbano completes the trifecta of restaurants built by Christian Mena and Lino Oliviera, rooted into the Boardwalk with their adjacent establishments Sabor Divino and Bodega Tapas and Wine Bar. Urbano was not only inspired by the pizza trend in the U.S., but also a family-driven need to accommodate dietary restrictions. The concept allows for a completely customizable pie, factoring in the needs of celiacs, vegetarians and vegans. 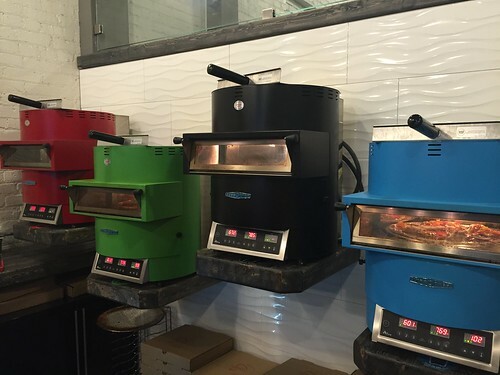 Their investment in TurboChef ovens also help propel another selling feature of Urbano – speed. 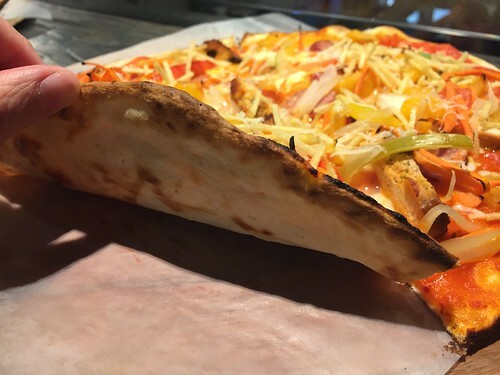 Freshly-prepared pizzas can be fired in 90-120 seconds, a new record in the city, and one that will not only make them a popular lunch destination but also, when the arena opens next year, a probable pre-game stop for many. Last Thursday, too lazy to cook, Mack and I visited Urbano for dinner. While the handful of patio seats were taken, there was only one other party inside. I’m sure the word is still travelling about Edmonton’s newest pizzeria. The former health food store has been transformed into a modern space, with pops of red accenting the mostly neutral colour palate. To emphasize the made-to-order nature of Urbano, the front counter is not unlike that of quick-serve sandwich joints, visually showcasing available ingredients. 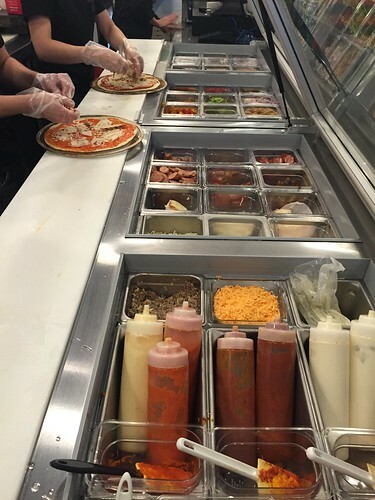 The ovens are front and centre, and allow customers to actually see the pizza baking in front of their eyes. That day, surveying our six pre-designed signature options, Mack and I settled on the bacon & eggs ($11.95) and Piri squared ($11.95). 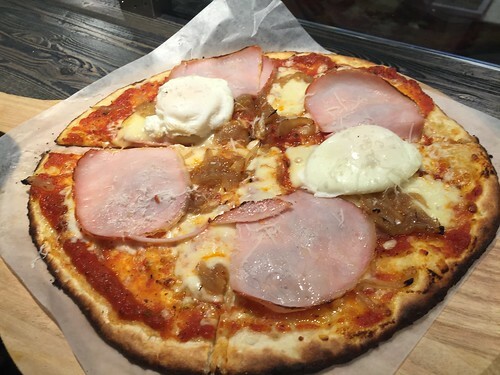 Customizable pizzas start at $11.95, and Urbano also serves salad and gelato (something that will be handy if the scorching temperatures continue). After ordering, we had a seat, and the pizzas were brought to us (we didn’t time it, but it was pretty quick). The crust was very thin and crispy for the most part. The width also lent the pizza an overall quality of lightness, so would be attractive for those seeking a lighter meal. Mack was impressed that his pizza actually had poached eggs on top that hadn’t been overcooked. Alongside back bacon, Caciocavallo cheese, and onion jam, Mack always enjoys breakfast-inspired concoctions for dinner, but didn’t find it particularly special. 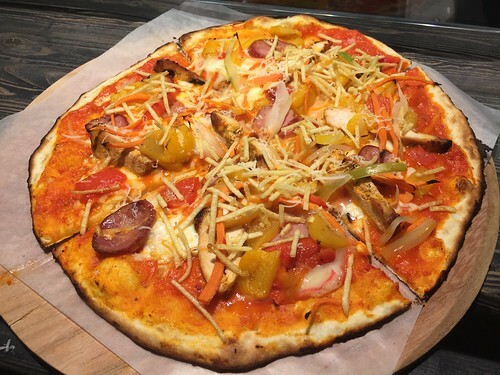 The Piri squared featured some ingredients I haven’t had before on a pizza – piri-piri chicken, Portuguese chorizo, Limiano cheese, fire roasted red pepper sauce, shoestring potatoes and pickled vegetables. While I wouldn’t say they all complemented one another, it was nice to see a flavour connection to its sister restaurants. Service was friendly, and as mentioned before, efficient. 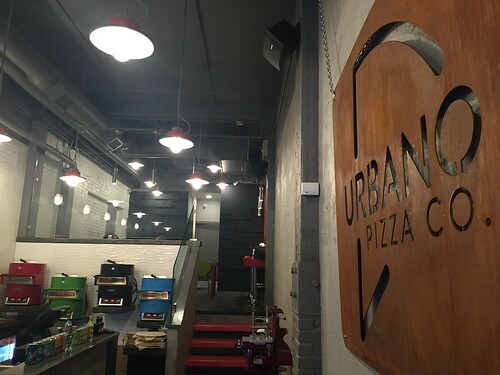 Only time will tell if Urbano as a concept will take off, but given the near-universal love of pizza, it may one day stand as an example of adaptable fast food that doesn’t compromise quality.